As one of the latest additions to Berlin's extensive dark tourism portfolio, a new exhibition opened in September 2011 in the authentic site of the former main GDR border checkpoint between East and West Berlin, the so-called "Palace of Tears" at Friedrichstraße station. The latter had already had another element of dark history, namely from the Nazi era, which is also commemorated by means of a poignant monument. 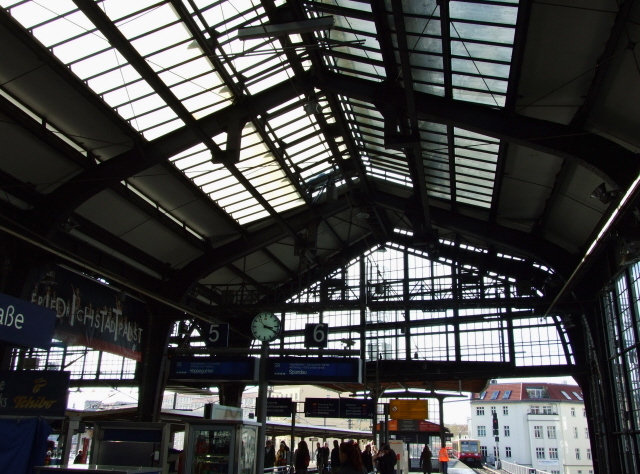 More background info: The building of the Friedrichstraße station was originally begun in the second half of the 19th century as part of the rapid expansion of the transport system in the growing metropolis Berlin. After WWII, Friedrichstraße station became especially infamous as the main border crossing point between East and West Berlin. The station was actually located entirely within the Eastern sector of the city, i.e. on GDR territory, but trains from the Western parts of the city would still stop here and provide the relevant transport links, while being more easily controllable by the GDR authorities than any of the other stations on the border itself, where there would have been direct contact with the Western Allies (at least until the building of the Berlin Wall). Friedrichstraße thus became the exception to the rule by which all other stations on lines served by the West but running through Eastern territory were turned into "ghost stations" (see Nordbahnhof). Instead, Friedrichstraße became the border crossing point for Westerners visiting the East (mostly to see relatives rather than as tourists in those days) or for those few Easterners who were allowed to travel to the West (mainly pensioners). To handle the border traffic, the station was subdivided into separate Western and Eastern platforms, with walls shielding one from the other, and separate border checkpoints for West-East vs. East-West crossings. The underground maze of tunnels people had to pass through formed part of the intimidation tactics the GDR authorities employed in the process. After the building of the Berlin Wall in 1961, the whole border checking/crossing process for GDR citizens was conducted in a purpose-built structure outside the station itself. 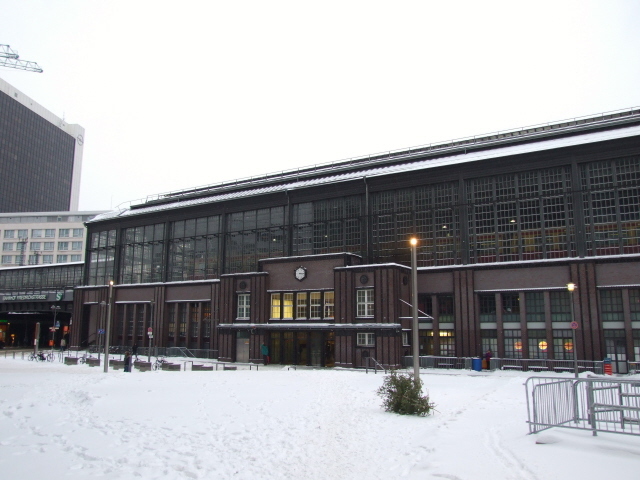 This building, which has a modern trapezoid shape with very high ceilings and a broad glass front and sides, soon became informally known as "Tränenpalast", or 'Palace of Tears', amongst those who had to use it. The epithet is, of course, an allusion to the many tears shed here when Eastern and Western family members had to say goodbye to each other at this place. Border crossing proceedings were deliberately orchestrated both with security in mind as well as humiliation. One element of this was the narrow booths one had to pass through, hardly wide enough to turn around in, while being inspected by a border guard towering above behind glass. The exit doors had no handles and would only open when a border guard pressed a buzzer. This particular sound remained one of the most memorable elements for all those who ever passed through this system. Smuggling or attempts to flee the GDR also took place at Friedrichstraße, including some tragic cases, such as when a group of six tried to cross into the West by means of forged Western diplomatic passports. But then one of them gave the game away when she was asked her name by the border guard and responded by saying her real name (i.e. not the name given in the travel document) and thus all six were arrested and sentenced to long prison terms. As if the humiliation, the hours on end of queuing, the general degrading treatment of people was not enough, the place actually cost lives too, for over 200, mostly elderly, the ordeal was too much and they died at Friedrichstraße. For the most part, however, the darkness of the place was primarily of a symbolic nature. After the fall of the Berlin Wall and the subsequent reunification of Germany, the 'Palace if Tears' became redundant and fell into dereliction. 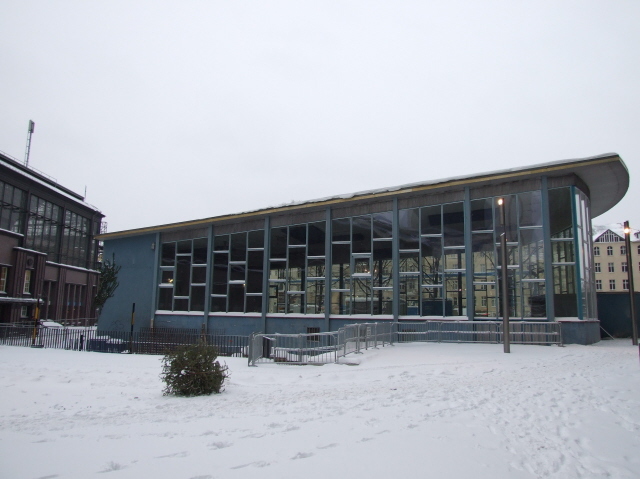 For a while it was used as a venue for clubbing, music gigs and comedy shows, but after the 'Palace' was declared a listed building and the area around it sold for development, the club had to move out (it still exists under the name of "tRÄNENpALAST", however) and the plan for a proper memorial was drawn up. After extensive structural refurbishment, the new exhibition inside the Tränenpalast, which has been devised by and is run under the aegis of the German foundation "Haus der Geschichte" ('house of history'), finally opened in September 2011. The exhibition is called "Grenzerfahrungen" in German, which is a play on both the literal meaning 'border experiences' and the figurative idiomatic meaning of the German expression which includes semantic components such as 'borderline', 'on the limit', 'extreme'. The subheading "Alltag der deutschen Teilung" – 'everyday life in divided Germany' – does not quite hit the nail on the head, though, as the exhibition is not so much about ordinary life either side of the border, but precisely about the very extra-ordinary experience of the GDR's regime's border-crossing restrictions that people had to go through here. With regard to covering the emotions of such actual border crossing experiences, the Tränenpalast site is probably best suited – together with the former inner-German border crossing point of Marienborn. What there is to see: The station as such is just that these days: a regular station. Nothing inside or on the platforms would remind you of the special role it once had. The overhead walkways that used to be patrolled by GDR border security forces armed with machine guns are still there, but empty, so you'd have to know what you're looking at to get any residue of that eerie feeling that sort of scene used to exude … Nothing else of the former border control installations within the station building itself remains. The actual dark sites are to be found just outside the station proper. The main one is the adjacent building, the so-called "Palace of Tears", the former border crossing installation of the GDR. Inside there is now an exhibition. Its premier exhibit remains the building itself, but there are also a few remarkable other original artefacts. The exhibition is roughly organized into thematic blocks, of which the whole general experience of the border crossing procedures form the main part. But in addition individual personal stories are relayed too, and a final section puts it all into the context of the peaceful revolution of 1989, the fall of the Berlin Wall and the subsequent reunification of Germany. Probably the single most impressive object is one of the passport check booths that you can enter and feel the oppressive narrowness of space inside. On the other side of the glass, though, there are no border officials, only a uniform on a hanger as well as a telephone and a few bits of paper. Nor is the infamous buzzer opening mechanism of the rear door recreated – so you can, as a visitor today, simply leave as soon as you like. Gone, too, is the connecting corridor to the Friedrichstraße station beyond. Instead there is now only a window. Insights into the behind-the-scenes goings on the part of the Stasi officials are represented for instance by means of a mock-up of a CCTV video control room, complete with curtains in typically oppressive 1970s GDR design. The strictness of the border regime is also illustrated through documents that back then instructed the border guards (what they should be looking out for etc.). Furthermore, there are displays of items smuggled through the border crossing (successfully or unsuccessfully), stories of attempted escapes (mostly unsuccessful at this particular place) and coverage of public protests. A lot of interactive, multimedia elements have been worked into the exhibition – e.g. small screens set into mock-up suitcases full of various objects where visitors can watch/listen to related videos. Overall, the mix of artefacts and information and different media is well-balanced, with not too much of potentially overwhelming text to get through. Labelling is in German and English, but many exhibits themselves featuring text are in German only and no translations are provided. The interactive video screens offer a choice of language and/or are subtitled – and the standard of translation is generally very good. Unrelated to the GDR/Iron Curtain topic of the Palace of Tears, but also worth a look when at Friedrichstraße station, is an ensemble of sculptures on the other side of the building which is dedicated to an earlier dark chapter in history: it is entitled "Trains to Life – Trains to Death", and commemorates simultaneously the Kindertransports of 1938-39, which took some 10,000 (mostly Jewish) children from Nazi Germany to safety in Great Britain, on the one hand – and on the other hand the subsequent deportation trains to the concentration camps, ghettos, and eventually the death camps in the east (i.e. Poland, mainly) in the worst phase of the Holocaust during WWII. The bronze ensemble consists on the one side of a pair of children, a young girl with a teddy bear in her arms and a taller boy carrying a suitcase, looking somewhat worried but hopeful – walking in a westerly direction. And on the other side, their backs to the exiled survivors, a group of five children, one bearing the "Jude" star, trudging dejectedly away from two suitcases, one of which is flung open to reveal a broken doll (one-legged, and with only one, torn-off arm). You'd think it should all be transparent enough, but I overheard a mother trying to explain to her daughter the meaning of the monument but getting it quite wrong (taking the transports to London to be the "trains to death"). So it is probably a good idea that the monument is complemented by two large informational text panels on the station wall that briefly but clearly explain it all (in German and English). Location: right in the heart of the central district of Berlin Mitte, sandwiched between the Spree river to the north-west and the eponymous street, Friedrichstraße, to the east, as well as Georgenstraße to the south. Details: very easy to get to, given the fact that Friedrichstraße station serves as one of the most centrally located and most convenient transport hubs of Berlin. The main part of the station above ground is served both by long-distance trains as well as several regional metro lines (S-Bahn), namely S5, S7, S9 and S75; underground two more important lines have a stop at Friedrichstraße, the S1 and S2/S25; in addition Friedrichstraße also has a metro station (line U6). The Trains to Life/Trains to Death monument is right outside the U-6 exit on Georgenstraße on the southern side of Friedrichstraße station building and is freely accessible at all times. The Palace of Tears is to be found on the other, northern side between the station and a newly developed shopping and office tower complex. Take the Reichstagufer exit. Opening times: Tuesday to Friday 9 a.m. to 7 p.m., and 10 a.m. to 6 p.m. on weekends and public holidays, closed Mondays. No photography inside the exhibition (and it's policed! – namely by guards with wireless earpieces who are constantly patrolling the exhibition … in a kind-of bizarre echo of the former authoritarian function of the site …). Larger bags and coats have to be left in the lockers provided. Time required: very much dependent on how much you already know about the topic of the exhibition inside the "Palace of Tears". Guided tours last one hour, which is a good indication. Add another 10 minutes or so for a good look at the deportation train monument and its information panels on the other side of Friedrichstraße station. Combinations with other dark destinations: plenty – closest by are: the Berlin Story shop and exhibition, two blocks down Friedrichstraße on the corner of Unter den Linden, is just five minutes' walk away. At that street's western end, beyond the famous Brandenburg Gate, you get to the new government quarter with the Reichstag at its heart just to the north; further south lies the Holocaust Memorial. Carrying on further south on Friedrichstraße you get to the former Checkpoint Charlie and its popular museum, which would also make for the perfect match thematically with the Palace of Tears exhibition. Just west of this you can find another one of Berlin's recently opened dark exhibitions, at the so-called Topography of Terror. The various public transport lines furthermore provide direct connections to destinations as far apart as Wannsee or Potsdam and Oranienburg (for Sachsenhausen) or Tempelhof. Combinations with non-dark destinations: given that Friedrichstraße station is one of the most significant transport hubs in central Berlin, it could hardly be more conveniently located for combinations with everything else this city has to offer. Within easy walking distance is the central boulevard of Unter den Linden, with the iconic Brandenburg Gate at its western end, and beyond it the new government quarter. In the other, easterly direction, the street leads to the Museum Island (Museumsinsel), the most significant cluster of museums in the city and hence one of its principal tourist attractions.